SuiteCRM - The award-winning user-friendly, enterprise-class Customer Relationship Management application at your finger tips. A customer's perception is their only reality and customers expect an immediate, high quality and personalised service. SuiteCRM provides users with a set of tools to help build, strengthen and maintain their relationships with customers and prospects. This allows them to plan, market, sell and service smarter with a faster, professional and more personalised service. SuiteCRM is functionally equivalent and more to the major product suites like Salesforce, Oracle, SAP and Microsoft Dynamics. By deploying SuiteCRM quickly and easily on UCS you reap the benefits of the UCS central identity management system. Sales Force Automation - Model, measure and understand business opportunities. Quotation and Product Management – Quickly create and issue Quotations with a central product catalogue to control pricing strategy. Contracts - Keep track of important renewal dates with automated reminders. Configuration Tools - Create entirely new Modules or modify existing modules easily to fit your business environment using the in-built configuration tools. Customise fields, layouts and relationships to streamline your application without requiring a developer. The substantial advantage of UCS over single deployment stacks like Bitnami on Oracle cloud is that it brings directory services such as LDAP and OAuth as a core function. This means that customers can deploy the business applications they need such as CRM, ERP and Document Management and control access and security to them from a central point. Users benefit from a single sign-on to all applications they have permissions to access. This greatly reduces complexity and improves security for systems administrators in small and medium sized businesses. 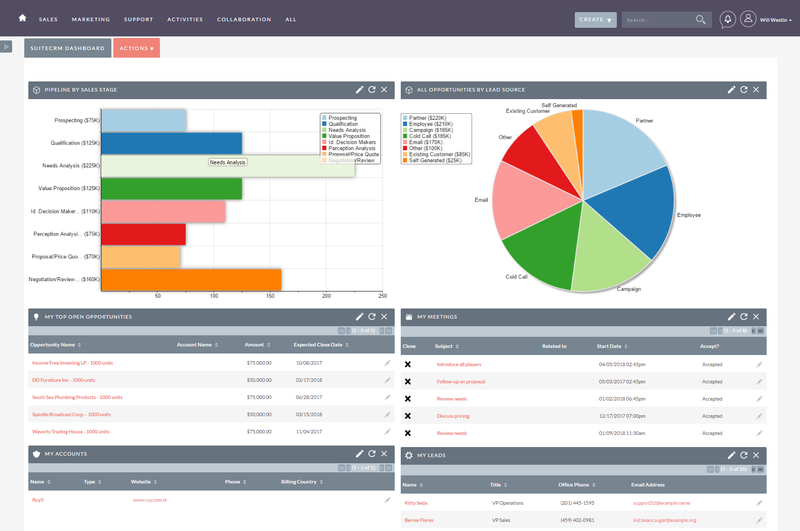 SuiteCRM is written, supported and extended by SalesAgility. DIGITEC integrates SuiteCRM to UCS. You can manage your users and roles directly in the Univention management system. Free commercial use. Some functions or services are liable to costs.